Evans Wins Rookie of the Year ~ The Bucky Channel - The World of Sports from Wisconsin's Perspective. Everyone knew Tyreke Evans would win the NBA Rookie of the Year because of his stats, but if you go by whose team did the best, than our Brandon Jennings would be your man. 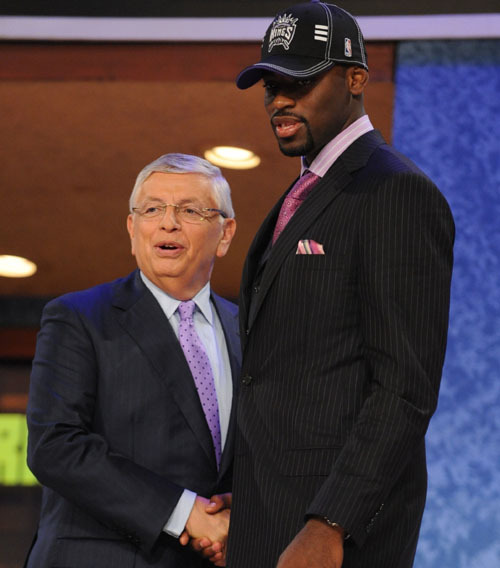 I can't take away any credit from Tyreke Evans who played a hell of a season. He averaged 20.1 points, 5.8 assists, and 5.3 rebounds a game. The guy is going to be a monster for this Kings team, they just need a big man to go with him. Just think how scary Oklahoma City would have been if they had taken Evans. His team however had a rough year as they finished last in the West's Pacific Division with a 25-57 record. They picked up Carl Landry at the trade deadline, but still need a big center if this team ever wants to go somewhere. Stephen Curry took second place to Evans. I question this one a little, because his style of play he only fits with a few teams. But he got drafted by the Warriors, which is a great fit for him. Still, this team was a wreck this year. They had people hurt all the time, so Curry was able to do whatever he wanted. He had some awesome games, but he played all 48 minutes most of the time so its hard not too. If he was on an organized team I don't think his stats would be as good. And then we get to Brandon Jennings. Bucks Jesus took third place, and judging from these playoffs I'm not exactly not sure why, but he did. Jennings found about not winning the award before game five, and that motivated him to come one firing. Jennings said after the game, "That's why the quick 12 points was in effect, and the big free throws down the stretch, to prove I was capable of helping this team win." He also talked about how Tyreke had an awesome season, but he had to get ready for game six so his team could move on in the playoffs. Some people may see this as him being cocky, but it is true Milwaukee is one win away from the second round. Evans meanwhile has been probably golfing or something for the past two weeks, in between when he's not watching BJ3 in the playoffs. ESPN had their own picks about who should win the award. My new two favorite people on ESPN are Jalen Rose and Chris Broussard who both picked Jennings as the winner. My guess is they felt the same way I did, and you should get more votes based on how your team did. With Evans stats I find it hard not to pick him, but Jennings should have taken second if not win this thing. Third is a joke, but like Brandon said who cares. Lets instead worry about the Hawks in game 6 of the Playoffs. That's right Evans and Curry I said PLAYOFFS. Reminder Game 6 is Friday night at the Bradley Center on ESPN, or else if you have tickets I may run into you. FEAR THE DEER!!! !